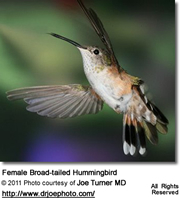 The following hummingbird species are known to occur in Nevada. 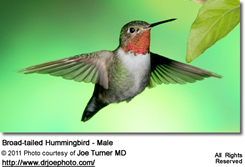 Most hummingbirds visiting Nevada are seasonal visitors that arrive in mid-March for the summer season and leave by mid-September for their wintering territories. 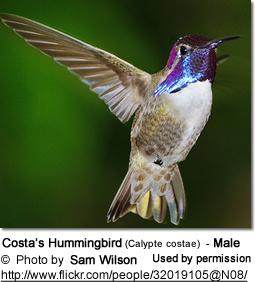 The exceptions are Costa's and Anna's Hummingbirds, which may remain year-round. 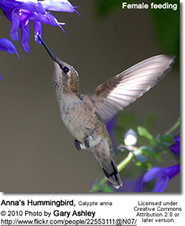 Anna's Hummingbirds, Calypte anna - Native- The only year-round residents and the largest hummingbird species in that region. 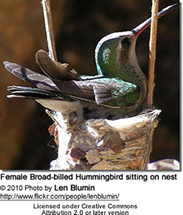 They nests from December to June in the foothills of Nevada. 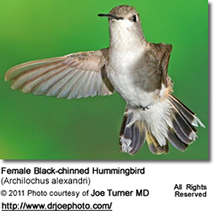 Black-chinned Hummingbirds, Archilochus alexandri - Native. 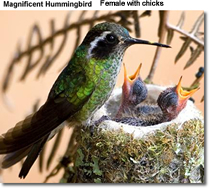 They nest from April to August in lowland areas; and may move up into foothills or lower elevations of mountain slopes later in the season. 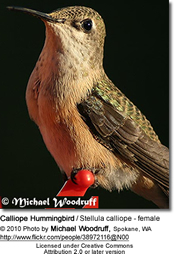 The smallest hummingbird in that region. 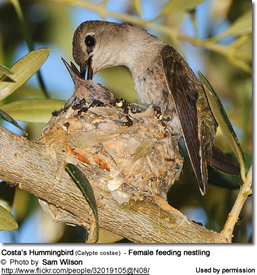 Costa's Hummingbirds, Calypte costae - Native- Historically only summer visitors; however, an increasing number of them now remain year-round residents - Fairly common in southern Nevada, around Boulder Beach at Lake Mead and in gardens around Boulder City. 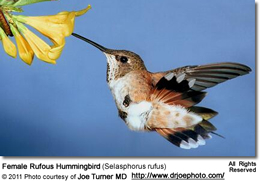 Broad-tailed Hummingbirds, Selasphorus platycercus - Native- Seasonal Migrant. Move south to winter in Mexico, Guatemala and, occasionally, El Salvador. 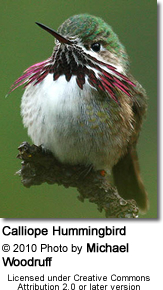 Calliope Hummingbirds, Stellula calliope - Native- Seasonal Migrant - They nest from mid-May through July in high mountain forests and meadows, almost to timberline. They migrate south or east for the winter. 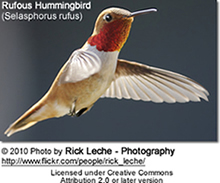 Rufous Hummingbird, Selasphorus rufus -Seasonal Migrants - Occur in Nevada from March through May - during the northward migration to their breeding grounds in the Pacific Northwest to Alaska; and again as they travel south to their wintering territories in Mexico and Central America in late June through September. 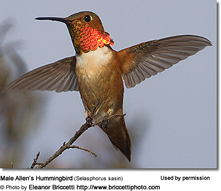 Allen's Hummingbirds, Selasphorus sasin - Rare vagrants - The Allen's Hummingbird is often confused with the Rufous Hummingbird, but the Allen's can be identified by the green back whereas the Rufous Hummingbird has a coppery back. 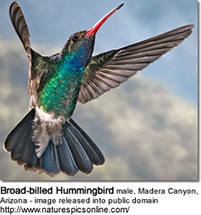 Broad-billed Hummingbirds (Cynanthus latirostris ssp magicus) - Rare vagrants - These mostly Mexican hummingbirds venture into the United States regularly; they mostly visit the southern parts - but a few vagrants travel as far north as Wisconsin. 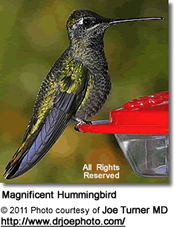 These are large hummingbirds and can often be identified by their size alone.